Plot Summary: When a certain man is released from prison, he knows exactly where he's heading first. After falling in love with a traditional comic storyteller's rendition of the story called "Shinigami," he is determined to become his apprentice. The performer, Yakumo, has never taken an apprentice before, but to everyone's surprise, he accepts the eager ex-prisoner, nicknaming him "Yotaro." 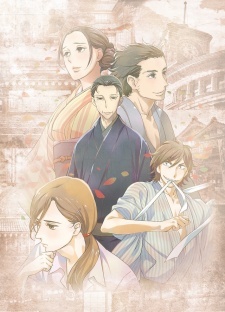 As Yotaro happily begins his new life, he meets others in Yakumo's life, including Yakumo's ward Konatsu. Konatsu was the daughter of a famous storyteller, and Yakumo took her in after her father's tragic death. Konatsu loved her father's storytelling, and would love to become a performer in her own right—but that path is not available for women.